View of Center City from Stiles Street. 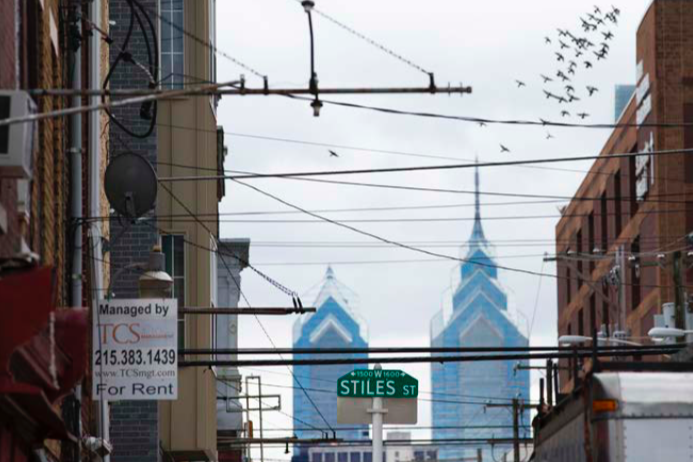 Since the turn of the century, neighborhood change in Philadelphia has qualified as gentrification in just 15 out of the city's 372 residential census tracts, according to a set of definitions laid out in a report published Thursday by the Pew Charitable Trusts. • The tract’s median income had to have increased at least 10 percent in inflation-adjusted dollars from 2000 to 2014, a period in which the median income of the city as a whole actually fell by about 10 percent. • The tract's 2014 median household income figure had to exceed the citywide median of $37,460. To some, these criteria would appear to circumvent the racial focus and hyperlocal histories behind the fiercest gentrification debates in cities across the United States. What Pew's report proposes, however, is that in Philadelphia, many neighborhood changes are associated with gentrification but driven by other nuanced patterns of growth, decline and resettlement. Income change in Philadelphia census tracts. The areas where gentrification did occur, according to this report’s income-based definition, fall into four distinct categories, based largely on what the neighborhoods were like in 2000. One set was characterized primarily by working-class, African-American populations, another by mixed-income, mostly white ones. A third group consisted of old industrial areas with relatively few residents. The final category comprised nonaffluent sections of Center City and adjacent neighborhoods. The pace and scope of change were different in each of the neighborhood categories. Notably, Pew's report found that Philadelphia's gentrified tracts were not among the lowest-income areas of the city in 2000 and 12 of them had a higher percentage of white residents than the city as a whole, at the time. The most dramatic instance of gentrification was Graduate Hospital: the neighborhood's black population fell from 7,793 in 2000 to 3,450 in 2014, while the number of white residents more than tripled during that period. Though it would be difficult for a report of this kind to disarm the political tone of street-level attitudes about gentrification, its immediate value lies in the abundance of data it has compiled over a measurable period of time — from real estate prices and construction to education levels, racial composition and public opinion. It encourages a closer look at the forces of gentrification rather than the day-to-day tensions, real as they are, on which those forces make impacts both visible and invisible to the naked eye. 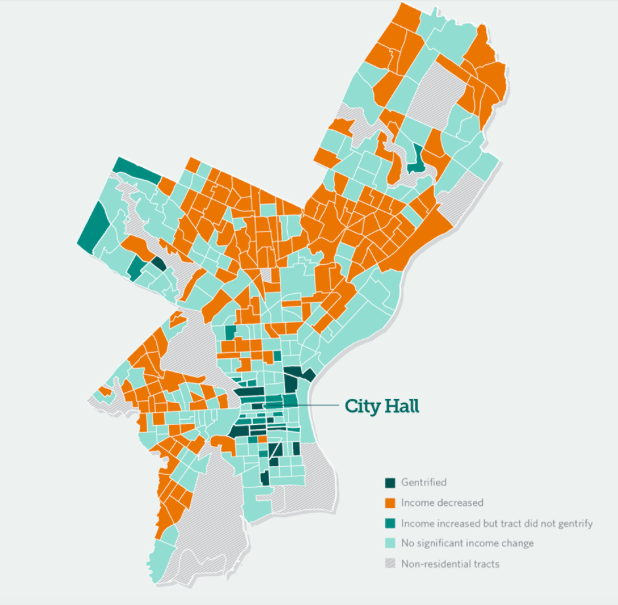 What jumps out more than anything is the extent to which poverty has risen in Philadelphia and continues to shape the horizon of its neighborhoods across all factors brought into the equation. "How widespread the phenomenon and other forms of neighborhood change become in the years ahead remains to be seen," the report concludes, "particularly in areas more distant from downtown in a city where far more neighborhoods have been losing ground than gaining economically."